The driverless car: another evidence of how our current technology is now able to liberate us from having to work. The driverless car is expected very soon to impact dramatically the transportation industry and make millions of taxi and truck drivers jobless. 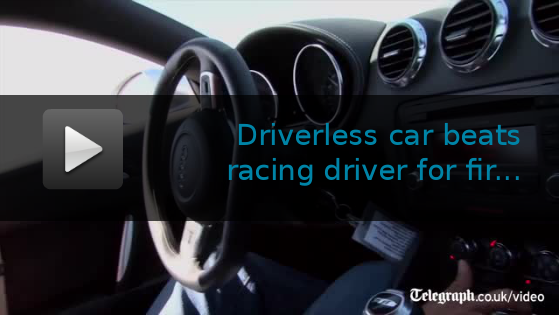 As this article demonstrates, driverless cars already outperform our best drivers. They will be much safer on the road than those driven by humans. Also there will be no need to own a car. The car will come to us when we need it. We will all be driven in the latest models. Why own a car that is unused most of the day, that needs a parking spot each time we use it and that needs to be looked after? Boat and planes are already equipped with autopilots. Soon we won't need to go to an airport. Drones will pick us up at our door. Once we run the driverless machines with renewable free energy, transportation by land, air and sea can become free. There will be no need to own anything. Everything could be brought to us by driverless machines for when we need it and be removed when we don't. Everything could be shared. Why owning a washing machine when we could have our dirty laundry, picked up, washed, dried and ironed by driverless washing machines that come directly to our house when we call them. When we own something we need to find a place for it, we need to maintain it and it becomes quickly obsolete. Tomorrow we will be delivered by driverless machines the latest equipments we need that will be built and maintained by the robots of our local workshop. Everything could be owned and shared by the community. In fact, what we really want is not to own something but to have easy access to it. This new technology of driverless machines just does that. It gives us easy access to the things we need. And that will profoundly change our way of life. Sharing will replace buying. Ownership will be seen as very cumbersome, irrational and old fashion. As a matter of fact, the less we own, the freer we feel. Everything we possess needs some caring. Looking after our things takes away our time and energy, our freedom to be doing what we really like to do. Everything we own is like a little ball and a chain that we drag with us all the time. We are possessed by what we possess. Let's celebrate the arrival of the driverless machines as another critical step towards the society without work and money.